As it celebrates its 50th anniversary, Dan Wesson brings back its legendary switch-barrel revolver. From 1938 until the early 1960s, Daniel B. Wesson—great grandson of the Daniel B. Wesson who lent his name to Smith & Wesson firearms—served as the quality control czar at that company. And under the younger D.B. Wesson’s careful watch, Smith & Wesson became a leader in the production of high-quality handguns for military, police and recreational shooters. But by 1963 America’s industrial landscape, including gun manufacturing, was changing. Smith & Wesson was sold to Brazil’s Bangor Punta in 1963, and Dan Wesson wasn’t impressed with the company’s new leadership and manufacturing protocols. So, in 1963, Wesson walked out the doors of the corporation his grandfather helped build, intent on starting his own firearms manufacturing company. That new company, which would become known as Dan Wesson Firearms, began in 1968. Wesson approached Karl R. Lewis, a machinist who’d spent time with Browning and Colt. Lewis had a revolver design that he’d been shopping around for a few years to major manufacturers, but no gun company had taken the bait. Dan Wesson knew about the design—a modular revolver that allowed the shooter to quickly and efficiently switch barrel lengths—and he wanted Lewis to take the concept forward under the Dan Wesson name. The earliest Dan Wesson revolvers models, released in 1970, included the W8, W9, W11 and W12, all of which utilized Lewis’s switch-barrel design with screw-in barrel tubes housed within a removable shroud. They came with a feeler gauge that allowed owners to quickly determine the proper cylinder gap each time they swapped barrels. The early models had a rather offbeat, some would say ugly, look. The primary sticking point was the barrel nut that extended beyond the shroud. In 1971 the Model 14 (fixed sight) and Model 15 (adjustable sight) Dan Wesson revolvers were released, and they had a more contemporary look, including a recessed barrel nut. The Model 15, in particular, would become the flagship Dan Wesson switch-barrel revolver. The brand grew in popularity during the 1970s. Some shooters questioned the design, but the initial skepticism didn’t last long. Silhouette shooters quickly realized Dan Wesson revolvers offered superb accuracy, and soon the Model 15 became the “it” gun in competition circles. But in 1978, following Dan Wesson’s death, the company began falling on hard times. Production had been taking place in Monson, Massachusetts, in a gutted and renovated school building, but the facility simply wasn’t capable of producing firearms in volume. The company was sold and declared bankruptcy in 1989 before being purchased by Dan Wesson’s son Seth. Production facilities were moved from Monson to Palmer, Massachusetts, but financial woes and outdated equipment led to production issues. The company was sold in 1996 to Robert Serva, who moved Dan Wesson to Norwich, New York, its current home. Serva spent a great deal of time and effort rejuvenating the brand. CZ-USA bought Dan Wesson in 2005, and in the years that followed under new ownership, Dan Wesson began offering a variety of 1911 handguns. For 2018, though, the company brought back the Dan Wesson 715, and revolver fans were excited to see that the classic wheelgun was once again in production—this time backed by CZ’s modern production capabilities and state-of-the-art facilities. The new gun retains many of the same features of the Model 15, most notably the switch-barrel design. The tensioning barrel nut on the original Dan Wesson revolver extended from the front of the muzzle. The new 715 places the nut within the barrel shroud for a cleaner look. To install one of the included barrels, the barrel tube is screwed into the frame, and a feeler gauge is used to determine the proper cylinder gap. 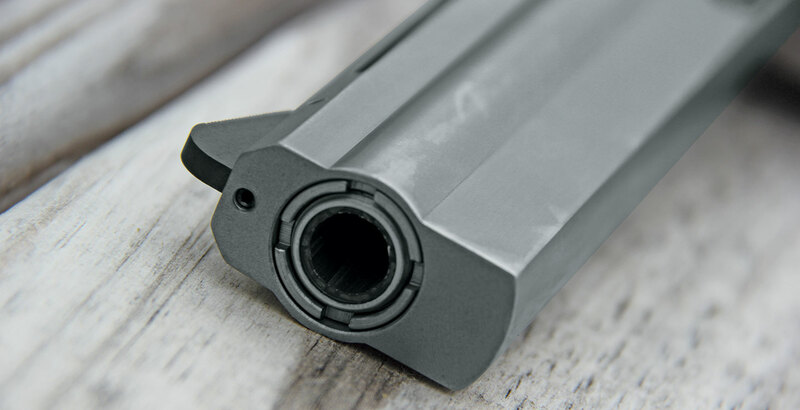 Once the barrel tube is in place, a stainless barrel shroud of the same length is fitted into the frame over the barrel and in line with a guide pin that extends from the lower front portion of the frame. A barrel nut is then tightened into place and the gun is ready to fire. The frame is made from cast stainless steel, and the metalwork on the gun bears a brushed stainless finish. The heavy barrel profile with full underlug and ventilated top rib gives this gun a beefy look, and the large black rubber grips are designed for maximum control and comfort. Lewis’s earlier Dan Wesson revolvers utilized a coil spring design instead of the more traditional leaf spring setup, and as a result these guns have a short, stubby grip frame compared to other double-action revolvers. That not only makes the gun lighter but also allows the grips to be switched out quickly and easily with one of the supplied Allen wrenches. 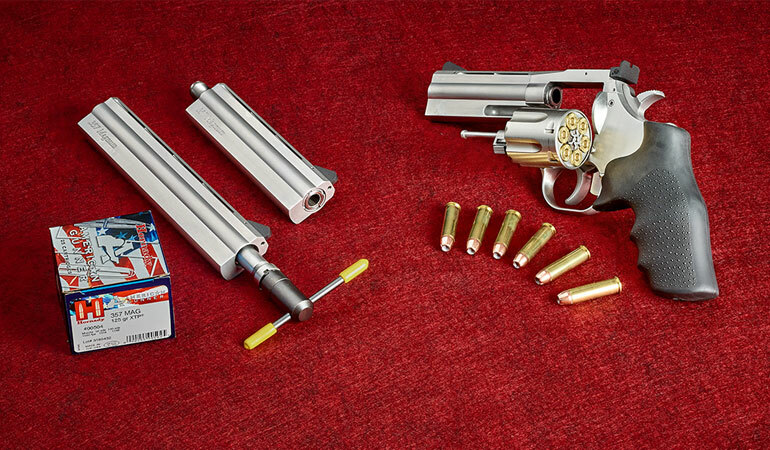 Unlike many double-action revolvers, the Dan Wesson 715’s cylinder release is located on the crane. This means the cylinder locks at the front and at the rear for a secure, robust system. The other defining feature of Dan Wesson revolvers is the crane-mounted cylinder latch. The design offers superior strength because it locks not only at the rear of the cylinder with a ball-detent system, but also at the front of the cylinder—a more robust design than standard rear-locking revolvers, according to the company. If you’ve grown up shooting Smith & Wesson, Ruger and Colt double-action revolvers, it may take some time to adjust to the positioning of the cylinder release, but once you get the hang of it, the Dan Wesson design becomes intuitive. Additionally, the cylinders in the chamber are recessed slightly, and a lip of steel rises up around the cartridge case for added strength. Since the cylinder travels in a clockwise direction (the same direction that the crane locks), there’s no additional stress on the crane. 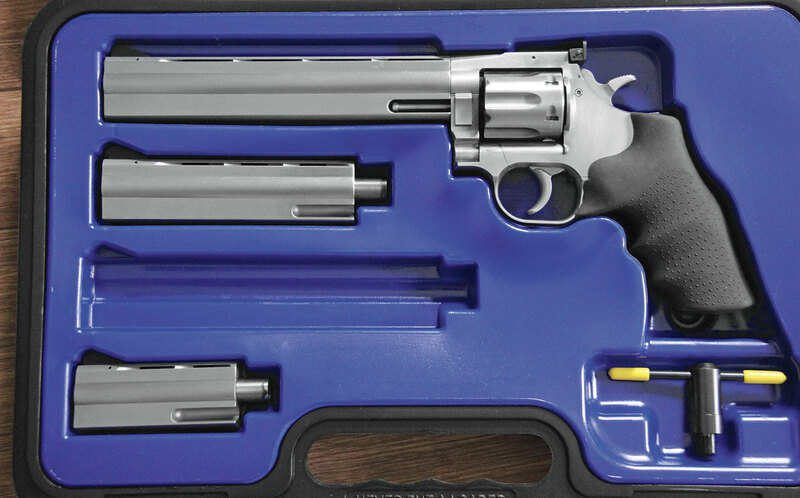 The Model 715 revolver is available with a single barrel, but I imagine that most buyers will opt for the 715 Pistol Pack, which includes four-, six- and eight-inch barrels and shrouds in a single hard-sided plastic carry case that can be locked for secure travel. The barrel assemblies are neatly arranged within the case, and a manual, barrel nut wrench, Allen wrenches, feeler gauge and cable lock are also included. The black rear sight on the 715 is screw-adjustable for windage and elevation, and all three barrel shrouds come with pinned, serrated black front ramp sights. In most light conditions the black sights work fine, but I’d say many shooters will end up altering the front sight (either replacing it or adding paint) so it’s easier to see in a broad range of light conditions. The hammer has a rather stubby spur, but it is textured and easy to grip, and cocking distance is short. Dan Wesson’s coil spring design makes cocking the 715 smooth and quiet (a concern for hunters), and there’s little question that Dan Wesson’s triggers are among the best in any production revolver. One of the primary reasons silhouette shooters of the 1970s and ’80s so loved these wheelguns is they came equipped with really good triggers, and this newest iteration is no exception. In single-action mode the trigger breaks cleanly at 4.4 pounds, and it feels more like it belongs in a rifle than a handgun. The trigger performs quite well even in double-action mode, with moderate stacking and a smooth, predictable 10.6-pound break. Properly evaluating the 715 meant testing all three barrels separately. That amounted to 125 rounds per barrel, 375 rounds total. A single-day evaluation of that sort with a .357 Magnum revolver could be listed as a distinct form of torture by the United Nations, so I admit I wasn’t looking forward to the hours I’d spend behind the revolver. As it turns out, though, the 715 is actually quite pleasant to shoot, even with full-power .357 Magnum loads. There are several reasons for this. The first is the oversized, soft-touch rubber grip that positions the hand high on the gun and helps mitigate much of the muzzle rise. Much like the trigger, I’d give the 715’s grip design a blue ribbon. Is it easy to conceal? Not really, but there aren’t a lot of shooters trying to hide a medium-frame revolver with a four-inch barrel in the waistband of their trousers. So many revolvers suffer from a serious lack of grip space, but the 715’s handles are the wheelgun equivalent of leather-trimmed bucket seats. Another factor that helps control recoil is the Dan Wesson’s mass. In the era of aluminum alloy and polymers, we’ve grown accustomed to ever-lighter guns. The 715 weighs between 40 and 52 ounces, depending upon which barrel/shroud combination it’s wearing at the time. 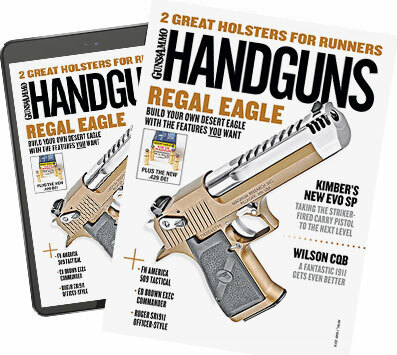 The frame and grips alone weigh 29 ounces, which is more than many concealed-carry semiautos. Dan Wesson could have shaved a few ounces here and there, but the all-steel construction and beefy frame make this a manageable revolver to shoot. The loads tested ranged from Black Hills’ 148-grain wadcutter with a muzzle velocity of 600 fps all the way up to several hot .357 Mag. loads that averaged 1,400 fps. The 715’s barrel design, which tensions the barrel at both ends, leads to superb accuracy. There were several loads, both .38 Special and .357 Magnum, that produced groups below 1.5 inches, and a few did even better. The very best group, somewhat surprisingly, came with the four-inch barrel installed. It measured right at an inch. The difference in muzzle rise and muzzle blast between the four- and eight-inch barrels, not surprisingly, was quite significant, and that adds to the versatility of this gun. With the four-inch pipe installed, the Model 715 is light and portable. Step up to the long barrel and this gun is pleasant to shoot even with .357 Magnum hunting and defense loads. Looking for a light-recoiling revolver to introduce new shooters to the sport? With .38 Special wadcutter ammo and the eight-inch barrel installed the Model 715 produces excellent accuracy with recoil that’s so light the barrel scarcely rises off the shooting bag with each shot. The Model 715 Pistol Pack ships with three barrels, a barrel nut wrench and a feeler gauge in a lockable hard plastic case—basically, three guns in one handy package. Lewis’s interchangeable barrel design is ingenious, and even the least mechanically inclined among us can quickly learn the procedure for swapping barrels and adjusting cylinder gap space. But don’t overlook the section in the manual clearly stating the barrel nut should not be overtightened. When the gun arrived, the barrel nut had been cinched down so tightly (with what I can only assume was some sort of high-powered pneumatic device) by the previous tester that it took a lot of effort and a fair amount of cursing to finally break the barrel nut free so I could switch barrels. Tighten the barrel nut as instructed in the manual and no more—unless you want your switch-barrel revolver to turn into a fixed-barrel model. Dan Wesson revolvers have garnered a small but fiercely loyal band of followers, but I believe now that CZ has taken the reins there’s hope that Karl R. Lewis’s revolver design will finally get the kind of mainstream exposure it deserves. After spending time at the range with the 715, I can be counted squarely among that cadre of tireless supporters. 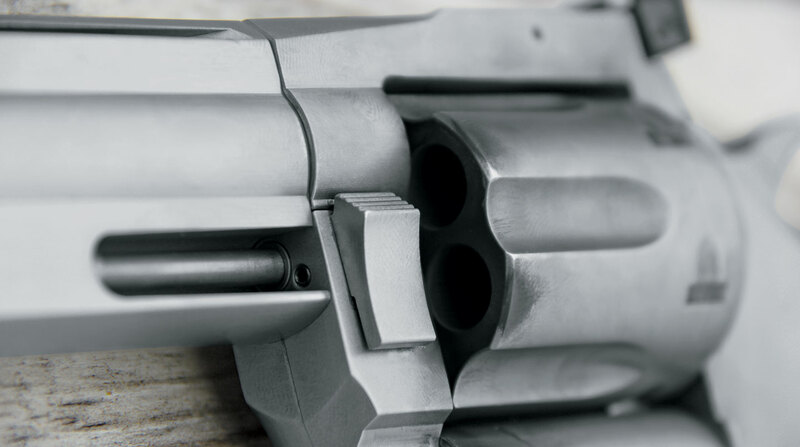 With durable all-stainless construction, one of the most robust locking designs of any revolver, a superb trigger and the versatility of easy barrel and grip swaps, the 715 certainly has a lot to offer shooters. There are a lot of revolvers out there, but there’s only one Dan Wesson. BARREL: 4, 6 and 8 in.